Fresh produce can be found at CAA Marketplace. Everyone who follows me on Facebook or Instagram knows I love to post photos of food. I don’t get to cook a lot except for an occasional backyard bbq which has to include grilled tarong, sili, and okra that I buy from my neighborhood Filipino market. Oh yes, don’t forget the lasona to dip in the patis or shrimp fry bagoong. Sometimes my wife will cook some chicken paria or chicken marunggay and if we have a lot of time, she will cook some dinengdeng. I’m sure everyone knows many of the fresh vegetables we buy are locally farmed by Filipino farmers—some with acres and acres of land or some, like my brother-in-law Jose Lampitoc, with smaller lots in Wailuku Country Estates (the former Wailuku Sugar macadamia nut farm land). The produce grown by Filipino farmers is an amazing A to Z list that includes arugula, bananas, bell peppers, bittermelon, bok choi, cabbage, Chinese cabbage, coconuts, cucumbers, dragon fruit, egg plant, green onions, marunggay, long beans, okra, papaya, peppers, pumpkins, romaine lettuce, round onions, squash, strawberries, sweet corn, sweet peppers, sweet potatoes, taro, tomatoes, and zucchini. 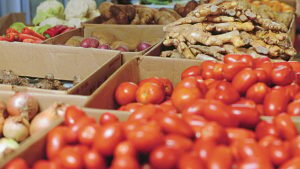 JMA Imports offers locally farmed tomatoes, onions, ginger and potatoes. 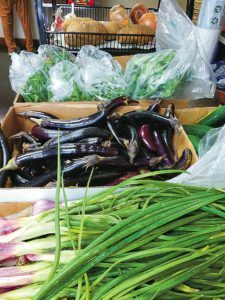 If you shop at JMA, Maui Greens, Pacific Fish Market, Paradise, Pukalani Superette, Rowena’s, Tamura’s, VIP, or Wailuku Seafood, the vegetables you buy were probably grown by a local Filipino farmer. If you shop at Costco, you don’t know where the vegetables came from. 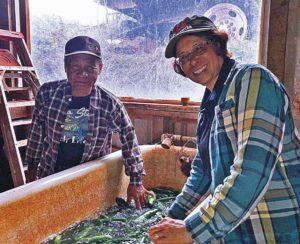 “Local produce is better than mainland produce because the mainland produce spends one month in the chiller before distribution,” said Fernando Traje, owner of Traje Farm in Kula. Traje is originally from Aklan on the island of Panay. 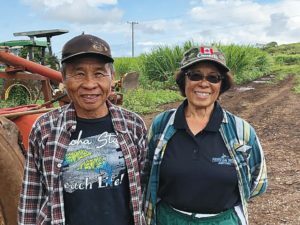 He was a student at the Aklan Agricultural College, majoring in Agriculture, when he came to Maui in 1988 as part of the Philippine Agricultural Training Program through the University of Hawai‘i. Traje’s cohort included nineteen students. They trained on Maui for two years and returned to the Philippines. A few years later, Traje was able to return to Maui after marrying his wife Evangeline. Fernando Traje proudly displays the egg plants grown at his farm. Others in the Philippine Agricultural Training Program also returned to Maui after the program. Noel Escobedo is farming in Kula, selling strawberries, tomatoes, onions and other produce. Pepito Valdez is also farming in Kula, selling egg plant, zucchini, cucumbers, tomatoes, round onions and other produce. Arthur Latayada, who participated in the 1979 program returned to Maui in February 1981 on a fiancée visa and married his wife Sigrid. In 1983, Latayada opened his farm, a ½ acre lot in Kula where he began growing green onions and red onions. 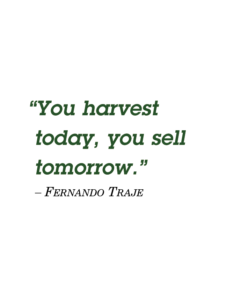 It would take Traje almost thirteen years before he opened his farm. He began working in the hotel industry in 1992 and started Traje Farm in Waikap&#363; in 2005, where he would farm bananas, long beans, and sweet potatoes. Arthur Latayada ‘s markets includes the annual Barrio Fiesta. Traje Farmers Market is now at Lower Main St. where Minit Stop used to be. Silvestre and Naty Tumbaga of Tumbaga Enterprises LLC dba Syl’s Produce stand proudly over their verdant soil. Latayada also cites weather and feral animals—pigs, deer, birds—as his biggest challenge. “Last year I lost a lot of money due to the weather,” he says. Traje agrees, citing weather and animals such as deer and some insects as his biggest challenge. Oby’s Farm LLC owned by Robert Mata in Waikapū across from Kahili Golf Course. Traje, like other farmers, has been assisted by the availability of USDA loans, which helped him to expand and buy machinery. He now has twelve farm tractors and a number of trucks and cargo vans. “It was easier to get a USDA loan and it really helps,” he said. Not all Filipino farmers are in Kula. Robert Mata of Oby’s Farm LLC is in Waikap&#363;, across from the Kahili Golf Course, and is approximately 75 acres. Mata grows okra, papaya, long beans, cucumbers, and bittermelon. 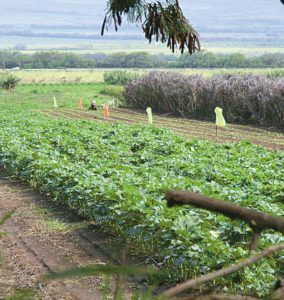 Tumbaga grows green beans, broccoli, broccolini, cilantro, cucumbers, eggplants, and sugar cane at their farm in the Kula Agricultural Park. These are sold at farmers markets, wholesalers, restaurants, stores, and to other farmer’s market vendors. 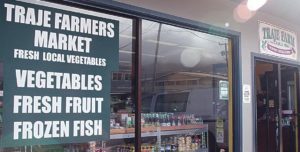 Finding a place to market their produce is an ongoing challenge. Latayada used to market his produce through the Maui Farmers Cooperative but it closed a few years ago. 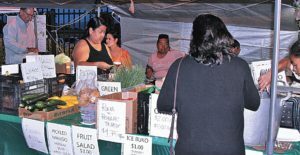 He now markets his produce at various farmers’ markets, the annual Barrio Fiesta, and through Kula Produce. 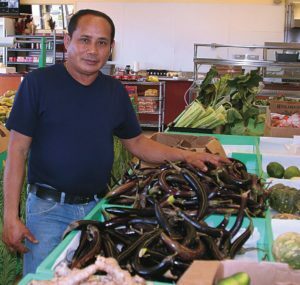 Traje also markets his produce through Kula Produce as well as VIP and a variety of Filipino stores: Paradise, Green Market, and Pacific Fish Market. To maintain freshness, the Tumbagas keep their cucumbers hydrated. Alfredo Evangelista grew up in Paukūkalo, where his family raised a few chickens, ducks, goats, and pigs. He doesn’t have a green thumb and has failed at planting a papaya tree and a kalamunggay tree in their Waikapū backyard. His wife Basilia is a little more successful and has been able to rescue their calamansi tree.